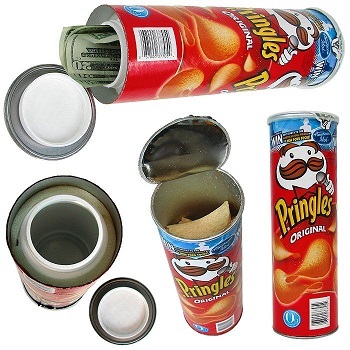 Our Pringles Original Diversion Safe lets you hide it in plain sight. Made from a genuine Pringles Container. This safe also has real Pringles chips inside to be a further convincing decoy. The best place to hide anything is in plain sight. The Chicago Crime Commission states that a burglar spends an average of 8 minutes in the victim's home. Put the odds in your favor... hide your valuables in plain sight.